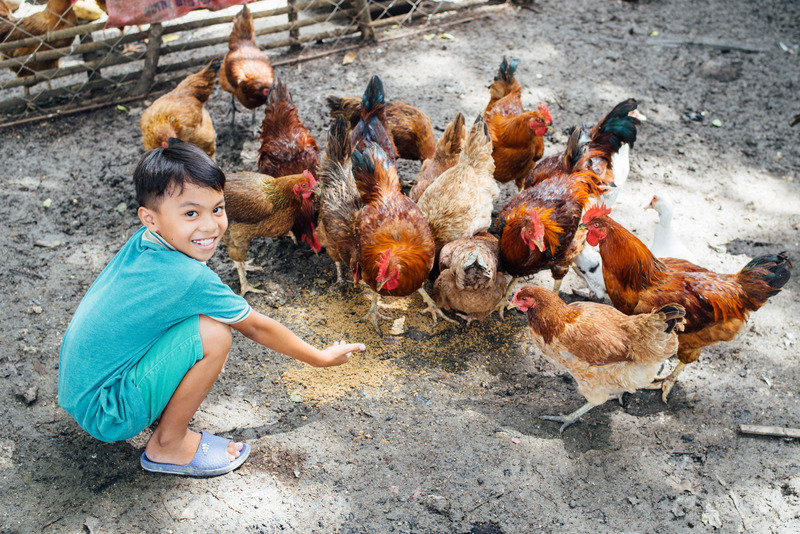 Photo: Our Philippines director’s son enjoys feeding the chickens at our free range poultry project. We are happy to report that there are currently 40 children (ages 6-15) enrolled in our Children’s Hope Center on the island of Cebu, an after-school care program which includes homework tutoring and other activities, along with snack and meal services for children suffering from extreme poverty. These children start back to school this Monday where they will be studying reading, writing, English, their native Filipino language, math, history, and science. However, our Cebu Hope Center program is struggling to come up with the funding to equip these 40 children with back-to-school essentials such as pencils, notebooks, backpacks, school uniforms, and new shoes. While our native team is working hard to provide what funds they can through their own farmland enterprise, they are still seeking donations to help meet them in the middle. They are seeking $2,000 to equip all the children in the Hope Center program and their own orphan girls at the Girls Home with the school supplies, backpacks, and uniforms needed to be ready for the new school year. The children in our VBS programs are always happy because we continue to take care of them — even the parents are thankful to us for the service that we’ve rendered to their children. Not only this but also their needs for school as well. We are so thankful to the Lord for the guidance and strength that He has given to us, even though there is a great shortage of financial income, we endure by the help of God and your continuous help and support to our works here in the Philippines. We recently expanded the size of our henhouse by adding on an extension which will give us more room to raise a larger number of hens, enabling us to solve some of our funding challenges. However, we need to buy 250 young hens which will lay eggs for 4 years. The capital required to purchase these new young hens is $2,457. The monthly net profit of our expanded henhouse project will be around $385, and the estimated net profit for the 250 hens’ 4-year egg-laying lifespans will be a projected $16,065. With your support, the investment and the restarting of our henhouse project will help with some of our funding challenges, providing more profits to help at-risk children and orphans succeed in school. Photo inset: (Top-left): Students enrolled in our Cebu Children’s Hope Center program receive homework tutoring. (Top-right): Our VBS-style outreach program offers children nutritious fresh-cooked meals. 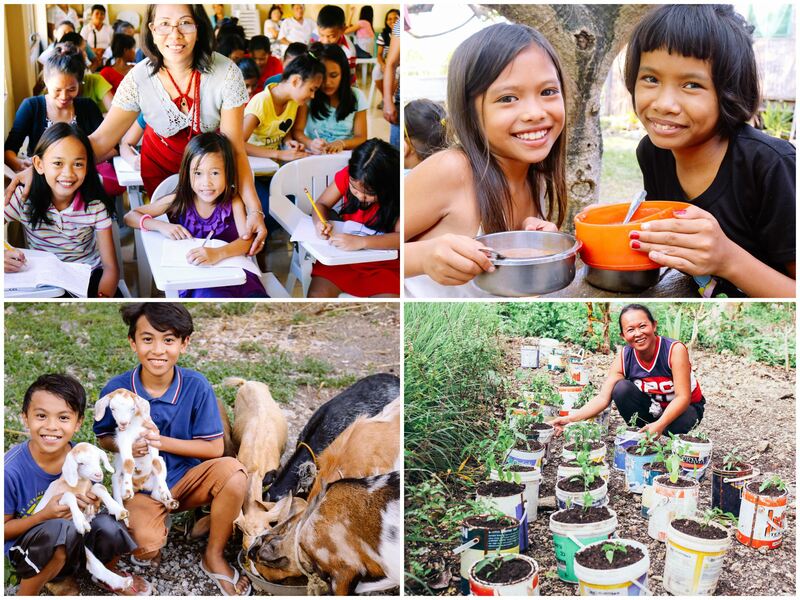 (Bottom-left): Our goat farm project is one of the many agricultural projects located on our Cebu campus which provides food as well as supplementing funding for programs. (Bottom-right): Our native team in Cebu recently implemented a new gardening technique called Containment Gardening. If a plant in a container garden becomes diseased, such as developing a fungus, it is less likely to spread to all the other plants in the garden. It is also much easier to treat plants in a container garden for pests. Container gardening makes it easier to save seeds to be used to create future plants, thus expanding our gardening projects. Growing plants in containers allows for portability, allowing our team to bring their plants indoors during storms to keep the plants alive throughout the entire year, providing sustainability. In more good news, other aspects of our farmland enterprise are flourishing. We now have 92 banana trees which will be harvested again in about 2 months — our last harvest yielded 7 large stalks of bananas. We also now have 10 papaya plants, our newest crop, which are harvested monthly. And we are currently growing chilies as well, which are harvested weekly. Our goat farm project is another one of the many agricultural projects located on our Cebu campus which provides food for our program recipients and supplements funding for our Cebu programs. We currently have 12 healthy goats after after our 2 pregnant goats gave birth this month. And we recently added 10 piglets to our newly-repaired piggery — the piglets should be matured and ready to sell to market in 3 months. We are thankful that our fishery is running smoothly with about 2,000 healthy fish, and that recent on-demand sales continue to be profitable. We recently made a change to our sales plan: instead of doing mass harvests to sell to market vendors, we are now selling smaller harvests on demand to families and smaller vendors.